As you have probably noticed, TVs are getting progressively thinner. While this means that your TV picture size and quality has increased, paradoxically the speaker space in many TVs has diminished, causing a decline in the quality of the TV sound. 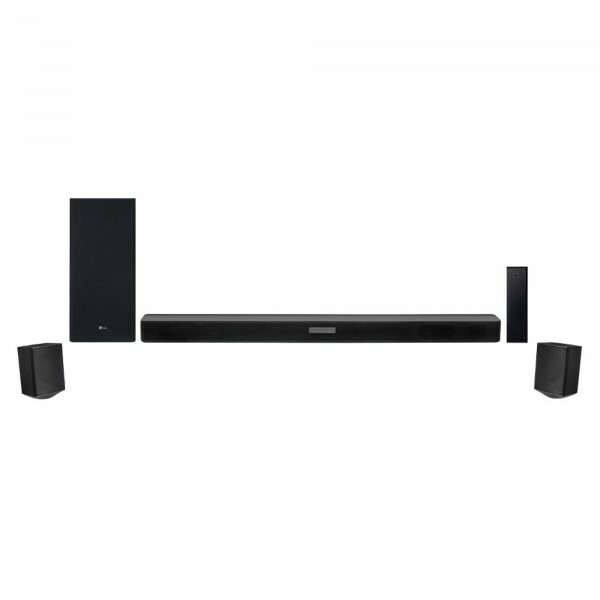 To keep the audio to your favourite channels, films and games powerful and clear with a cinematic surround feel, the LG SK5R high resolution audio soundbar may be the one to interest you. The sleek modern edge black design of the soundbar – sitting at only 57.5mm high, 891mm wide and 87.8mm depth – this should slide straight in front of your TV. The wireless subwoofer measures in at a height of 393mm, 171mm wide and 175mm depth, and has the same sleek design as the soundbar. Two rear speakers (122mm high, 88mm wide and 81mm depth) are also wall mountable if need be, allowing them to blend into your home comfortably. The soundbar itself can connect to the TV wirelessly via Bluetooth, so there will be only one cable coming out of the back and this also connects to the two rears speakers via an AV receiver, so they would be hidden out the way behind the sofa regardless. One of the main features of the LG SK5R is DTS Virtual X, a next-generation format for surround sound to compete against Dolby Atmos. In essence, the idea of DTS Virtual X is to effectively “shoot” sound vertically and horizontally around the room to create a three dimensional sound. The LG SK5R comes with advanced audio technology processing up to 24 bit/92kHz giving you high resolution studio standard of audio, with lossless playback ensuring you will experience a sound which is true to how it was intended to be heard. Adaptive sound control is yet another feature of the LG SK5R; it identifies what is playing on the TV and automatically changes it to the right configuration of sound mode to create the right kind of experience against the media playing. If, like me, you hate having a living area cluttered with remotes, you can control the soundbar with the original TV remote* or you can even download the remote application on your smart android phone/tablet and control your soundbar easily. I am pleased to see another soundbar that has been released with the rear speakers, as it delivers incredible audio to match the fantastic picture technology that we now see. Comparing this to other soundbars currently on the market, I’d say that this LG soundbar delivers great audio at a really competitive price. Once you factor in that this LG SK5R1 is delivering surround sound for under £300, it is little wonder that it’s so popular with our customers. Buy online, use our Click and Collect option to pick one up from a local store or ask your local Hughes store for more information or a demo. Selected LG, Toshiba, Samsung, Panasonic, Sony, Vizio, Sharp and Phillips models.